The new Christian P-4.0 motor starter from TELE is designed for motors up to 4,0 kW at 400 V, and includes five functions in one compact unit, requiring only 22,5 mm width. It offers a soft start, soft stop, forward/reverse, overload protection and an integrated 3-phase motor contactor. 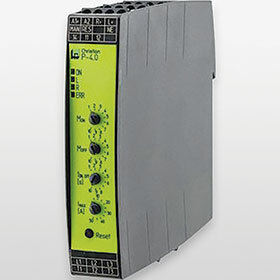 By offering integrated motor protection, the use of an external MCB is unnecessary. A simple circuit breaker protects the installation against short circuit and faulty wiring. The soft start and stop function is performed by reliable semiconductors (thyristors) and the reversing function by an internal relay. After performing the start process, the semiconductors are bypassed by integrated relays to minimise power dissipation. The above features help to protect motors, shafts and industrial plants from mechanical stress, and reduce maintenance and standstill times.